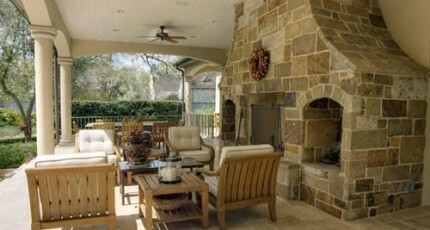 Outdoor kitchens provide all the full-service amenities of custom indoor kitchens. They are so efficient and comfortable that once a party moves inside one of these structures, there is never a need to go back into the house to retrieve cookware, food products, or utensils. Everything can be stored and retrieved from cabinetry built into the kitchen itself. It is also a top priority to make the summer kitchen visually work with the entirety of the Houston landscaping master plan. Architecturally, it is built to directly compliment the design of the home itself. By working as something of a mirror to the main house, it becomes a foundational thematic element in Houston landscaping design. Everything from walkways, patios, gardens, and tree walls can link to its aesthetic in a way that makes the entirety of the property appear as a unified world of outdoor living. Practicality is also a major consideration in every project. 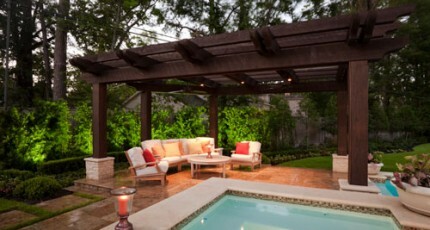 Most designs feature three walls and a roof so they can withstand the full range of seasonal Gulf Coast weather changes. Appliances in these covered outdoor kitchens not only include all the tools for indoor cooking, but also include grills and other tools for traditional outdoor barbecuing and grilling. It is our policy to build appliances, sinks, and pipes from stainless steel to protect these areas against corrosion. In the spring and summer time, there may be bouts of rain that lead to outbreaks of mosquitoes. 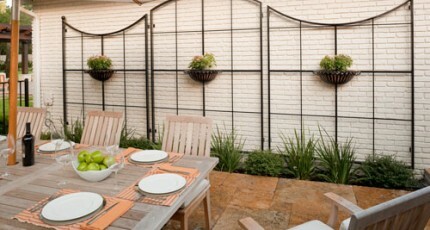 Steps can be taken to render to render the structure insect proof so summer parties can be enjoyed without impediment. 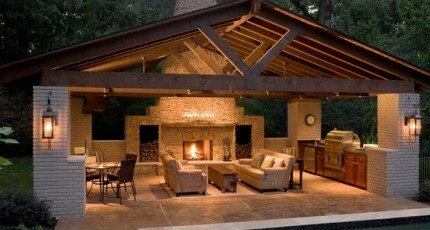 Luxury outdoor kitchens are built with fans and air conditioners that keep them cool in the spring and summer. Although the structure is completely open to the air on one side, there are three walls and a roof surrounding a very intimate, shaded interior. Even a low setting on a simple AC system, or a network of fans blowing through the room, creates the equivalent of a comfortable breeze blowing through a deeply shaded forest. People dining in this environment can feel the comfort of the indoor world without losing touch at any point with the feeling of Nature that Houston outdoor living is intended to provide them. For holiday parties in the late fall and winter, outdoor kitchens are comfortably warmed by heaters and beautiful fireplaces that are built into the dining and living room areas. This makes them ideal for family Christmas parties where kids can roast marshmallows in the fireplace, and guests can sit around on luxurious indoor furniture and open gifts after a full-course meal. The actual size of these seating areas, by the way, is always customized to the homeowner’s preferred number of guests for special events that are held for a select group of significant friends and family members. Overflow seating, however, can easily be accommodated for larger events by building a network of patios and walkways emanating outward from the kitchen. On those occasions when very large gatherings are held, each of these patio areas can become an outdoor dining area that allows everyone to feel included in the event. Houston outdoor kitchens are equipped with both interior and exterior light fixtures that create different layers of functional and decorative light. Lighting controls are also installed so homeowners can manipulate these layers to create different moods for different occasions. Plants, shrubs, and decorative trees are planted around summer kitchens to soften the aesthetic of the sophisticated architecture in a way that blends it harmoniously with natural elements in the yard.